General Martin was born in Liberty, Indiana, on November 26, 1882. He graduated from Purdue University in 1908, and was commissioned a second lieutenant in the Coast Artillery Corps. He first served with the 92nd Company, Coast Artillery, and the 26th Company, Coast Artillery, at Fort Flagler, Washington, to December 29, 1912. He attended the Coast Artillery School, Fort Monroe, Virginia, from December 29, 1912, to November 9, 1913, and upon graduation joined the 150th Company at Fort Ward, Washington, D.C., where he remained until January 1, 1916. General Martin was ordered to Hawaii for duty with the 143rd Company, and was stationed at Fort Kamehameha until October 3, 1917, when he returned to the United States for duty as Chief, Materiel Supply Section, in the Office f the Chief Signal Officer, and Director, Military Aeronautics, Washington, D.C., to August 19, 1918. The general sailed for France the last of August 1918 where he served in the Supply Section, Paris, until February 1919. Upon his return to the United States, he was assigned to duty in the Property Division, Office of the Director of Air Service, Washington, D.C., until August 23, 1920, and as instructor, Air Service and Air Service Pilots School, Langley Field, Virginia, until April 16, 1921. He attended the Air Service Pilots School and Bombardment School, Kelly Field, Texas, to June 30, 1921. He was Commandant, Air Service Mechanics School at Chanute Field, Illinois, to October 4, 1921; and then was appointed Commanding Officer of the U.S. Air Service Around-the-World Flight, which started on April 6, 1924. He was forced to relinquish command of the expedition on April 24, 1924, when the plane he was piloting crashed on the side of a mountain in Alaska. Although only slightly injured, Colonel Martin and his mechanic suffered many hardships during the next 10 days in their attempt to reach the nearest settlement on foot. He returned to the United States on June 30, 1924, and on October 11, 1924, attended the Air Service Tactical School, Langley Field, Va., graduating on Aug. 3, 1925. He attended the Command and General Staff School, Fort Leavenworth, graduating June 30, 1926. He then commanded Bolling Field, D.C., until March 30, 1927. He was Chief, Inspection Division, Office of the Chief of Air Corps, Washington, D.C., to July 7, 1930; Commandant, Air Corps Advanced Flying School, Kelly Field, to September 22, 1931; and Commandant, Air Corps Primary Flying School, Randolph Field, Texas, to July 3, 1934. He attended the Army War College, graduating on June 28, 1935, and was then assigned to duty as Executive Officer, Air Corps Materiel Division, and Commanding Officer, Wright Field, Dayton, Ohio, in which capacity he served until March 31, 1937, when he assumed command of the 3rd Wing, General Headquarters Air Force, Barksdale Field, Louisiana. On Oct. 1, 1940, he was promoted to major general (temporary) and assigned on October 4, 1940, to duty as Commander of the Hawaiian Air Force. He was assigned as Commanding General of the 2nd Air Force, with headquarters at Fort George Wright, on January 26, 1942. First lieutenant, March 11, 1911; captain, July 1, 1916; major (temporary), Aug. 5, 1917. He reverted to his permanent rank of captain on March 15, 1920, and was promoted to major, Regular Army, on July 1, 1920; lieutenant colonel, Aug. 31, 1933; colonel (temporary), June 15, 1935; brigadier general (temporary), Feb. 15, 1937; major general (temporary), Oct. 1, 1940. LOS ANGELES, California, February 25, 1954 – Major General Frederick L. Martin, who was in command of Hickam Field in Hawaii when the Japanese attacked on December y, 1941, died last night in West Los Angeles Veterans Center Hospital. He was 71 years old. General Martin, who was commander of the first round-the-world flight in 1924, took off from Clover Field, at nearby Santa Monica on March 24, 1924, in a Douglas world cruiser, a three-ton biplane powered with Liberty engines, accompanied by Sergeant Alva Harvey. The plane Seattle was the flagship of the four-plane flight. It crashed in Alaska, but the crew was rescued and the flight continued. On September 23, 1924, six months after the take-off, three planes and a crew of six again landed in Santa Monica. General Martin was born in Liberty, Indiana, and joined the Cost Artillery in 1908, after having been graduated from Purdue University. 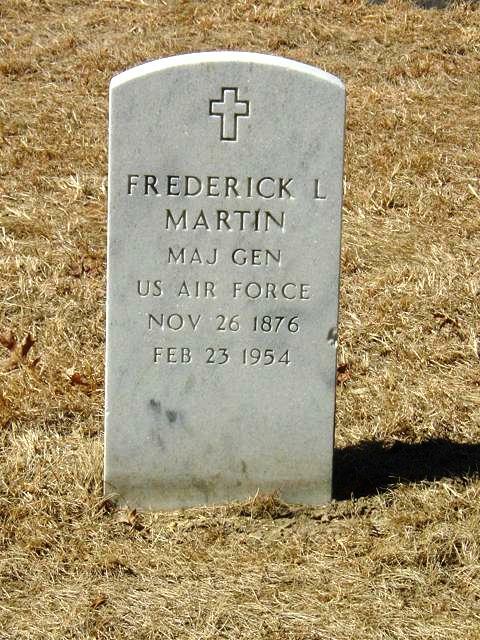 He leaves a wife, Mrs. Grace Martin, and a son, Colonel John R. Martin, USAF, of Baltimore. General Martin was one of the first men to receive the Distinguished Service Cross for military services performed in peacetime. Yet it was the curse of his long military career that he failed in the two greatest opportunities that came to him. He received the medal, usually reserved for wartime exploits, by special act of Congress by organizing and commanding the initial stages of the first successful flight around the world. The flight was also the first to successfully cross the Pacific Ocean, but the then-Major Martin never got that far. His plane was forced down at Portage Bay on April 15, 1924, less than a month after takeoff of the flight of four biplanes from California. Ten days later, after extensive repairs, he took off in an effort to catch up with the rest of the flight. But on April 30 his plane was lost between Chignik and Dutch Harbor in southwest Alaska. When he and the sergeant who was with him were rescued two weeks later the flight had reached Attu, Major Martin returned to Washington where another plane was to be fitted out to enable him to rejoin the flight in either Asia or Europe. But at his own request he was relieved of his command. Lieutenant Lowell H. Smith commanded the remainder of its journey around the world. General Martin’s second tragic failure came at Hickam Field in the Hawaiian Islands on December 7, 1941. In October of that year before he had been assigned to lead the Hawaiian Air Force Command. In the debacle of unpreparedness that occurred at Pearl Harbor during the Japanese attack, General Martin was one of three men who bore the brunt of the blame. The others were Admiral Husband E. Kimmel, Commander-in-Chief of the Pacific Fleet, and Lieutenant General Walter C. Short, Commander of the Hawaiian Department of the Army. There were demands from Congress that he and the two other officers be court-martialed, and eleven days after the attack all three were relieved of their commands. The next month he was named to command the Second Air Force, in charge of the defense of the northwestern sector of the United States. His headquarters were at Fort George Wright, Spokane, Washington.